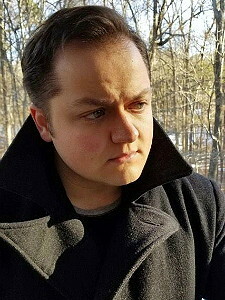 Christopher Ruocchio is the author of The Sun Eater, a space opera fantasy series from DAW Books, as well as the Assistant Editor at Baen Books, where he co-edited the military SF anthology Star Destroyers, as well as the upcoming Space Pioneers, a collection of Golden Age reprints showcasing tales of human exploration. He is a graduate of North Carolina State University, where a penchant for self-destructive decision making caused him to pursue a bachelor’s in English Rhetoric with a minor in Classics. An avid student of history, philosophy, and religion, Christopher has been writing since he was eight-years-old and sold his first book —Empire of Silence— at twenty-two. The Sun Eater series in available from Gollancz in the UK, and has been translated into French and German. Not to name-drop, but I asked George R.R. Martin this question at ConCarolinas back in 2014, and I liked what he said. He asked me, “Well, is there anything I could say that would make you not want to be a writer?” I said, “No.” He said that was a good start. My advice is this: don’t do it for the culture. Don’t do it for conventions and for the dream of having fans or of being important. You have to love the writing itself. You have to love hours of solitude and work, even when you spend eight hours a day in an office or behind the counter at a McDonald’s before the writing even begins. But beyond that, follow instructions! Publishers and agents both spell out what they’re looking for and how to receive queries. I work for Baen Books, and you would not believe how many people just send us submissions in the wrong genre or that are too short. And don’t give up. I was rejected 51 times by various agents, and I know writers who are published now by the very companies that once turned them down. In the meantime, it never hurts to read submission guidelines and submit in the cleanest, most appropriate fashion possible. What were your inspirations for character development? There’s no single point of inspiration for any one character. I tend to borrow character traits from various people I’ve met or from historical figures or other fictional characters and blend them together. Every fictional character is a kind of Frankenstein’s monster, if you think about it: pieces cribbed and borrowed and sewn haphazardly together. Hadrian is part Lord Byron, part T.E. Lawrence, part Faust (hence Marlowe), and part his historical namesake. I think we’re all sort of cobbled together like this, borrowing from what we admire until it becomes something new. I may be wrong about real people, but I’m certainly correct about fictional characters. No single flashing instant, no. My friends and I used to play make-believe on the playground. Originally they were characters from Dragonball Z and I was just...Batman, but over time we all developed our characters into something more unique and unrecognizable. I would write the accounts of our struggles on the back of my notes, and as my friends grew up and discovered football and social skills, I just kept writing. I would finish a story and throw it out and start over until, well...here I am. What was your unforgettable moment while writing EMPIRE OF SILENCE? About midway through the book Hadrian meets Valka, a woman who will be several sorts of important to him. I remember being very nervous to write her, as I remain nervous to write her. She is not an easy character for me to identify with or understand, and as such is very, very hard for me to write. She also wasn’t meant to appear in book one, and it was only at the urging of my first editor, Sarah Guan, that she be brought forward. I hadn’t expected to meet her until book 2, and so it was extremely nerve-wracking to have her appear so suddenly on revision (the back half of Empire was nearly completely rewritten). There were dates and job interviews I was less nervous for, it being so important that I get her character right. Well, I’ve been working for Baen Books now for more than three years, so I’ve had a chance to meet several writers. Meeting Kevin J. Anderson was a real honor for me. My dad used to read his Star Wars books to me when I was a kid, and so it’s a bit strange to me that we’re Facebook friends now. Kevin’s a real class act, and I really admire just how hard he works. That man dictates books while climbing mountains. It’s amazing. I’ve also had the privilege of interviewing Lois Bujold once, which was a surreal. My boss made me read her series when I started at Baen and I was so utterly blown away that I confess I stammered like a fool through our entire interview. Lois writes with a precision I could never emulate, and her character work is just sublime. I’ve been lucky to meet and work with several other writers, like my good friend D.J. Butler and Baen mainstays like David Weber, Eric Flint, David Drake, Jody Lynn Nye, and Sharon Lee and Steve Miller. I’m a huge admirer of Brian Staveley’s Unhewn Throne books from Tor, too. But most of all, I would just love to meet Gene Wolfe, if only once. I read the Book of the New Sun just after I sold Empire to DAW, and I just think he’s the finest writer in the English language alive today. What part of Hadrian did you enjoy writing the most? His melodramatic streak. Hadrian is an absolute showman and very much a drama queen, and he knows it. I think the only way one can write such a trait and get away with it given today’s cynical audience is to have the character sort of acknowledge it. He’s very self-aware and so when he’s given to these bits of grandstanding I take a positive delight in having other characters try to mock him for it. At one point someone asks if he’s a walking literary cliché and he just angrily snaps “Yes!” in their faces. It makes me laugh, though I expect most of you may just roll your eyes. That aside, I also enjoy how conflicted he is. I saw one review describe him as hating the empire he comes from, and I don’t think that’s right. He dislikes the abuses the powerful so often visit upon their subjects, but he doesn’t resent that power or the empire itself. It’s a fine distinction, and it’s these sorts of fine distinctions I love about him. If I had to pick any single book for anyone to read, I’d say “Read The Lord of the Rings.” Already read it? No problem: read it again. But let’s go for two: If you have not read Walter M. Miller, Jr.’s A Canticle for Leibowitz, I cannot recommend it highly enough. It won the Hugo back in 1961, and is the story of a Catholic monastery that survives a nuclear war in the American Southwest. It’s one of the most beautiful and haunting meditations on humanity’s struggle in the face of our many failures, and one that treats the topic of nuclear war with a seriousness I think we’re less capable of so far removed from the threat implied by Sputnik. It’s tremendous, and that it’s been rendered fairly obscure is a crime. Well, I’ve just turned the first draft of Empire’s sequel in to my editor, and I’m working on the outline now for book 3, pending revision notes. I’m also working on a novelette set in the same universe for an anthology called Space Pioneers that I’m putting together for my employer, Baen Books. It’s primarily a collection of older, reprinted stories (including a Poul Anderson story that we believe has never been reprinted, which is exciting), but Toni Weisskopf asked me to write an original piece for it. That will be out in December. That would depend on the why! I think it would be an absolute blast to see him encounter Miles Vorkosigan from Lois McMaster Bujold’s Vorkosigan Saga. They have a similar sense of humor that might make things entertaining. Diziet Sma from Iain M. Banks’ Use of Weapons might prove an interesting foil, too, and I think Hadrian would be very fond of Gurney Halleck. But most of all, I think Luke Skywalker is the character I’d most want Hadrian to meet. The Luke Skywalker of Return of the Jedi is perhaps the kind of person Hadrian Marlowe most wants to be. I don’t approve of the direction the character went in The Last Jedi, but there would be some very, very interesting conversations to be had between the two of them. My grandparents all passed away within about a year-and-a-half of one another, just as I was going into high school. It was a pretty difficult time, and it shook my comfortable childhood very badly and put a lot of stress on my family. I lost my religion, for a start, and entered into a decade-long battle with depression which I am pleased to report I have emerged from victorious. It’s only in the past three years that I’ve been able to really sort myself out again. Only a couple of weeks ago. My girlfriend is living in Miami, and so we have been passing letters to one another. Telephone and the internet are all well and good, but there’s something different about having a physical object from someone far away that seems more real even than speaking to someone over Skype. Spending time with my closest friends in grade school. It’s funny to say that: two of them will be my roommates next year and the other’s visiting home for the week of the book’s release (I can hear them playing video games in the other room as I write this), but something about their being here has impressed on me the way that time doesn’t roll back. When you’re a kid, adults like to tell you being a child is better than being a grown-up—and that’s wrong. I love being an adult: I have a wonderful family, good friends, the respect of my coworkers, and a woman I’m very much in love with—but there’s a part of me that does miss summer nights in middle school and Phantasy Star Online. We don’t talk about male friendships as a culture very much, but I love those guys. I was absolutely insufferable in high school, and I treated everyone around me—my family, my friends, my relationships—rather poorly. I’d take personal responsibility for my own shortcomings instead of blaming other people or the structure of reality and learn to treat both myself and other people with a bit more charity. None of us is who we want to be in high school, but if I could go back and make sure I was someone who wasn’t actively making his own life worse, I think that would be good. When I was very young, The Magic School Bus. My parents kept a tight lid on what I was allowed to watch until I was about 8 or 9. I am afraid I have rather too much in common with Arnold. I was also hugely fond of the ‘90s Batman cartoon and a rather obscure Hanna-Barbera cartoon called The Pirates of Dark Water, which unfortunately wrapped up unfinished. It was always playing at 5 AM in the morning before school, and it had some of the most wonderful worldbuilding I’ve ever seen in a Western cartoon. My gut instinct says the 1980s. Most of my musical and film taste run towards then, for a start. I’m a great fan of early metal music, for one, and I grew up on films like Highlander and the original Star Wars trilogy. Moreover, it seems to me to have been a time when we believed in our culture and its essential goodness a bit more than we do today. I think we could do with a deal more of that in these troubled times. Thank you CHRISTOPHER RUOCCHIO for making this giveaway possible. 1 Winner will receive a Copy of Empire of Silence (Sun Eater #1) by Christopher Ruocchio. Read. After my grandkids go to bed. It's the only spare time I have until school starts, then I'll be reading more. "Favorite things to do alone?" Drinking tea and reading a good book!